"How are you?" This simple question is not one refugees hear a lot — but one that can go a long way in helping them cope with stress and anxiety they are suffering from as a result of violence and other traumatizing events. "Refugees face a lot of stress and hardship fleeing from their country," said Alexandra Blattner, a psychologist who works at the anchor center for asylum seekers in Schweinfurt, Bavaria. "It’s very important to not only take care of their bodily health, but also their soul." 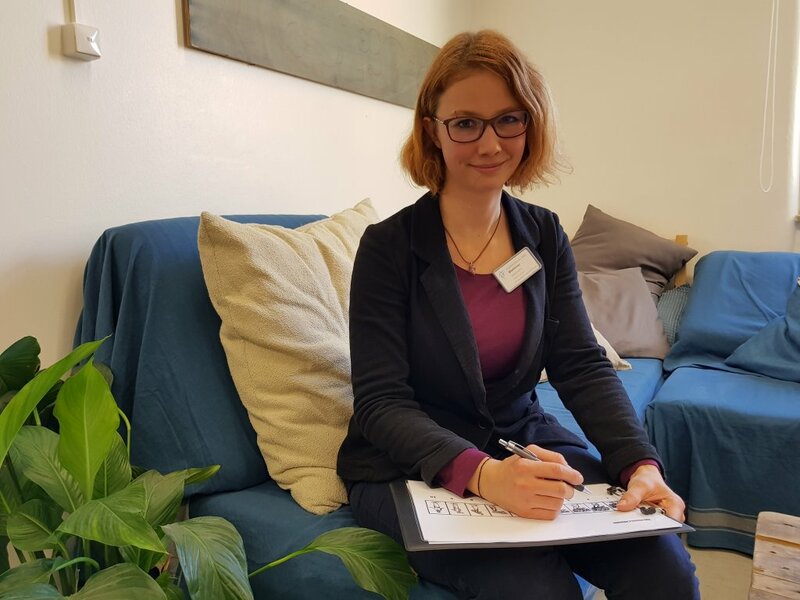 Blattner is the lead psychologist of a clinic for mental health dubbed "SoulTalk," the only psychosocial counseling concept of its kind in Germany. 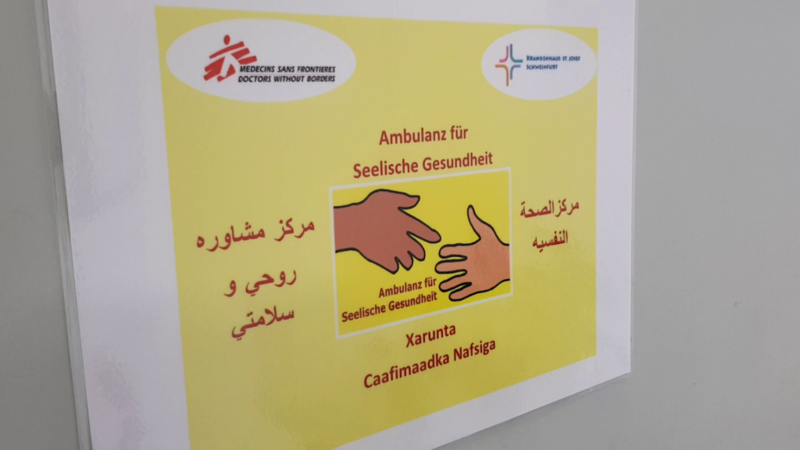 As a joint project between Doctors without Borders and the local St. Josef hospital, SoulTalk offers psychosocial peer counseling and psychoeducation to asylum seekers. At every meeting, former refugees who are trained as psychosocial counselors ask their peers "How are you?" in their mother tongue to find out what’s bothering them. The low-threshold approach — the shared language, home country and refugee experience — make it easier for the asylum seekers to trust and open up to their peers, Blattner said. "Many refugees don’t want to talk to their families about their inner problems and sorrows, so it’s good to use counseling services in mother tongue." 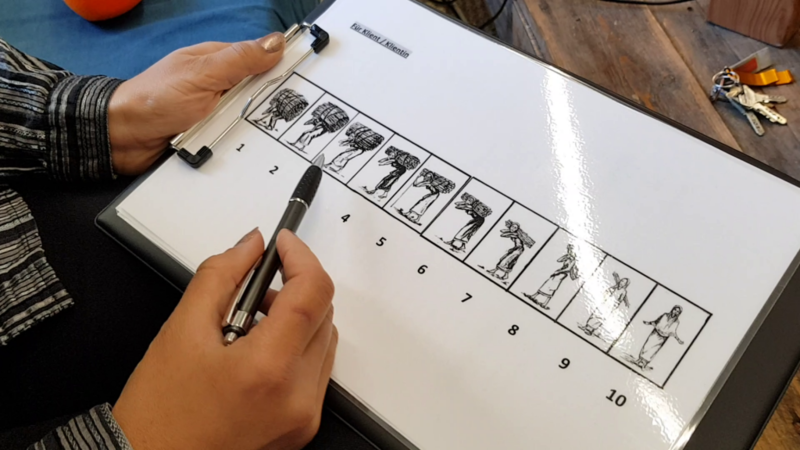 During psychoeducation session, taught in groups, asylum seekers learn coping strategies, stress management techniques and find resilience mechanisms. Although there are no comprehensive studies about refugees’ access to mental health services in Germany as of yet, medical and migrant aid organizations widely consider the existing support as insufficient. 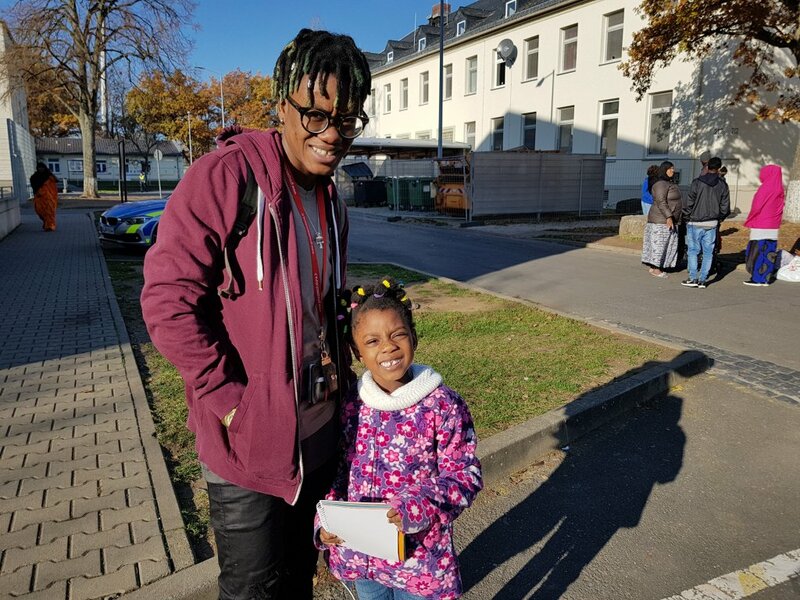 Grace*, a single mother from Ivory Coast, has been talking to peer counselors from SoulTalk since her arrival in Germany last September. She said the psychological support SoulTalk offers has really helped her. "It is great because there is a group to speak about many subjects, about stress, difficulty, so many mental problems," the 29-year-old, who fled from Ivory Coast more than two years ago, told InfoMigrants. Grace said she left her home because her family forced her to have a child although she is a lesbian. "I don’t want to expose them, but it’s because of my sexual orientation. Some people don’t accept this in Africa," she said reluctantly. Grace is a "client," not a "patient," a differentiation SoulTalk likes to emphasize. The stated goal is not to offer a replacement for therapy, but to prevent people from further harm. "We support refugees in a difficult situation to such an extent that they don’t fall chronically ill," Joost Butenop, refugee health advisor with the regional government, told InfoMigrants. Since March 2017, more than 500 migrants have received peer counseling and psychoeducation. This unique combination seems to be working: Between two and six percent of the anchor center residents visit SoulTalk regularly. Originally conceived more than 20 years ago by Doctors without Borders for refugees camps in crisis areas, SoulTalk is the first-ever project in Germany by the international humanitarian NGO. Parisa is one of three peer counselors currently working for SoulTalk. The Iranian mother and wife studied social work in Iran before coming to Schweinfurt in October 2015, a time when doctors examined 70 newcomers per day. Every anchor center offers standard medical health care free of charge, but the Schweinfurt anchor center is the only facility nationwide that offers psychosocial counseling. Elsewhere, asylum seekers have to cover professional psychological help out of their own pocket, except in cases of acute illnesses. Finding a psychologist or a psychiatrist and, if necessary, calling in an interpreter, is another challenge. Parisa realized she could help her peers when she was still an asylum seeker herself and many people, both female and male, approached her to talk about their problems. Soon after she started working for SoulTalk in 2017 after a four-week training, a client told her: "We need someone like us who listens to us and understands us," Parisa said. That’s when she realized she could make a difference. In the very first client meeting, Parisa and her two fellow counselors, who come from Syria and Djibouti, first explain their job. "We tell them: 'We're no doctors, we cannot prescribe medicine or therapy. We are psychosocial workers." After the obligatory "How are you?," they dig deeper. Depending on the answer, they might ask: "What does good mean?," or "What kind of bad?," to find out more about their state of mind. Parisa said the asylum seekers who consult SoulTalk are pleased with the SoulTalk team has done so far. "I’m happy when we helped someone sleep better or when they say: ‘You’ve made me more self-confident,’ optimistic or resilient." In the beginning, some of her clients had concerns that private information will be shared with the government. Thanks to educational work and word of mouth, however, those concerns are now by and large gone, she said. "Now they’re even coming to us voluntarily," she added. One former asylum seekers, who now lives in Schweinfurt, even comes back regularly to talk to Parisa about his problems. 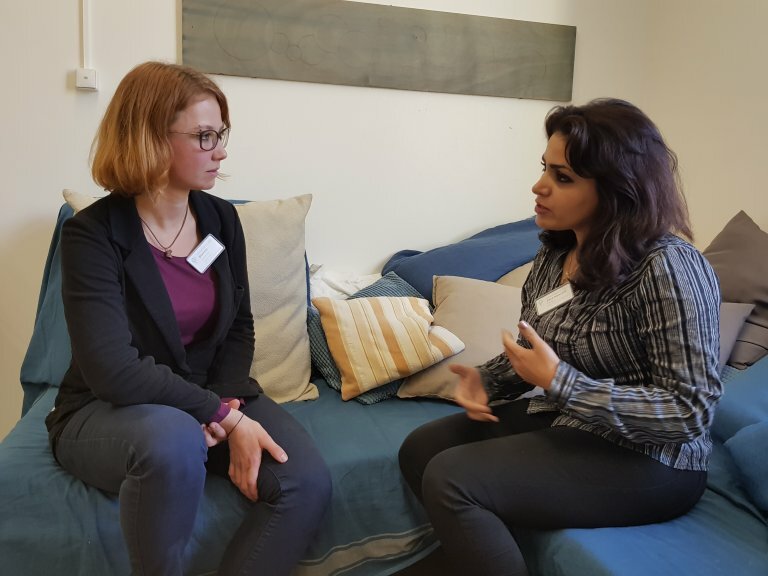 "Many of our clients now understand that their physical problems like a headache or a stomach ache might stem from mental stress," Parisa told InfoMigrants. "They tell us: 'The doctor didn't understand me, but now everything's fine." Health advisor Butenop doesn’t see a danger in the exposure of laymen like Parisa to clients’ hardships, a criticism sometimes voiced about peer models like SoulTalk. "It’s a preventive project, which is a different approach than psychology and psychiatry," Butenop told InfoMigrants. "They are not opening psychological wounds one cannot close without a professional background." Understandably, most of asylum seekers’ fears revolve around the uncertainty about their asylum status, worries about relatives back home and loneliness. As a result, they struggle with insomnia, anxiety and, at worst, suicidal thoughts. According to a recent study, three in four refugees from Syria, Iraq and Afghanistan have experienced violence and suffer from the physical and psychological consequences. However, "not everybody who has experienced trauma needs treatment," Butenop said. Last year, SoulTalk took third place in the crowdfunding contest of the German integration prize, raising more than 35,000 euros. Now that Doctors without Borders has withdrawn from the project as planned, though, that sum is not enough extend the so far privately financed project beyond this summer. That’s why the St. Josef hospital is currently looking for both additional private sponsors as well as more support from the regional government. Anchor center manager Alexander Warkotsch called SoulTalk a "first buffer" solution to keep residents' "emotional state stable." Both he and lead psychologist Blattner told InfoMigrants other anchor centers and reception facilities ought to launch similar psychosocial support services. The hope is that eventually, the model project will be replicated throughout Germany. Butenop, too, said there’s a need for more projects like SoulTalk, especially as the funding for many similar initiatives launched in the wake of the ‘refugee crisis’ is presently running out. "NGO support has been declining since 2015, specifically last year when many two- or three-year funding periods came to an end," Butenop said. "More low-key, preventive services" like SoulTalk, he added, would later help with "integration and social interaction on all levels."